[Two manuscript invitations for an exhibition opening, each including an original drawing in colour]. [Amsterdam, 1948]. Each 14.7 x 11 cm. Pen-and-ink drawings; one with blue watercolour and the other with blue and yellow watercolour. 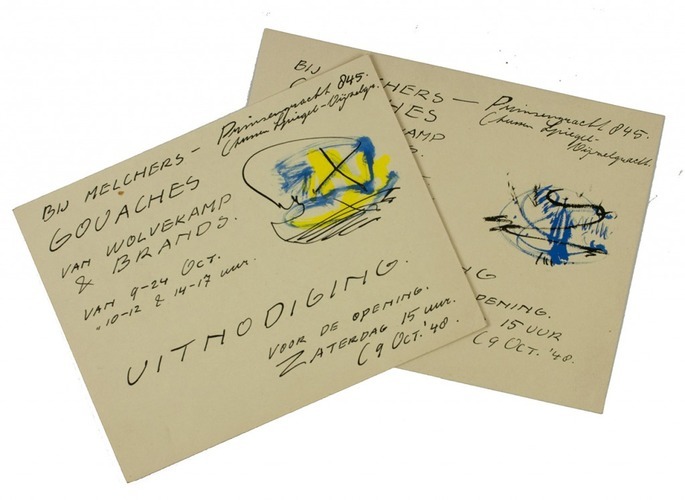 Two handwritten invitations for an exhibition opening, each with a variant abstract colour drawing by Eugène Brands (1913-2002), a Dutch artist who was briefly a member of the famous CoBrA avant-garde art movement. The exhibition, in which Theo Wolvecamp also participated, was held at the gallery Melchers (Amsterdam) in October 1948.